Joan Emerson's got some work to do-two rows deep! Hank Ryan is always on the cutting edge! Mary Garrett's cozy book nook! Margaret Title loves her craft books! Current reading: Ten Years Beyond Baker Street by Cay Van Ash. Diana Todd, parts 1 and 2! Pat Dupuy, Library books first! Alicia Collins was the winner of Krista Davis's MISSION IMPAWSIBLE. The book is on its way! And the winner of Leslie Karst's A MEASURE OF MURDER is Libby Dodd! Wow . . . so many books. Thanks for the look at our bookshelves, Lucy. 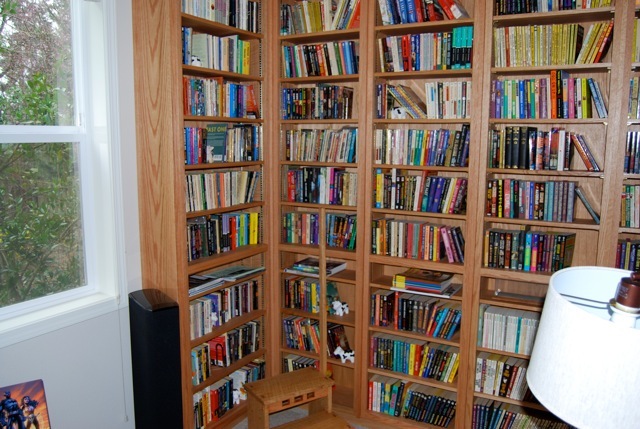 I love Mark’s bookcase bunk and I’m seriously envious of Richard’s wall of shelves. I definitely need some bookshelves like that . . . .
Glad to see I am amongst other reading addicts. Both of my photos have books that are two rows deep too, so I am in serious trouble, lol. 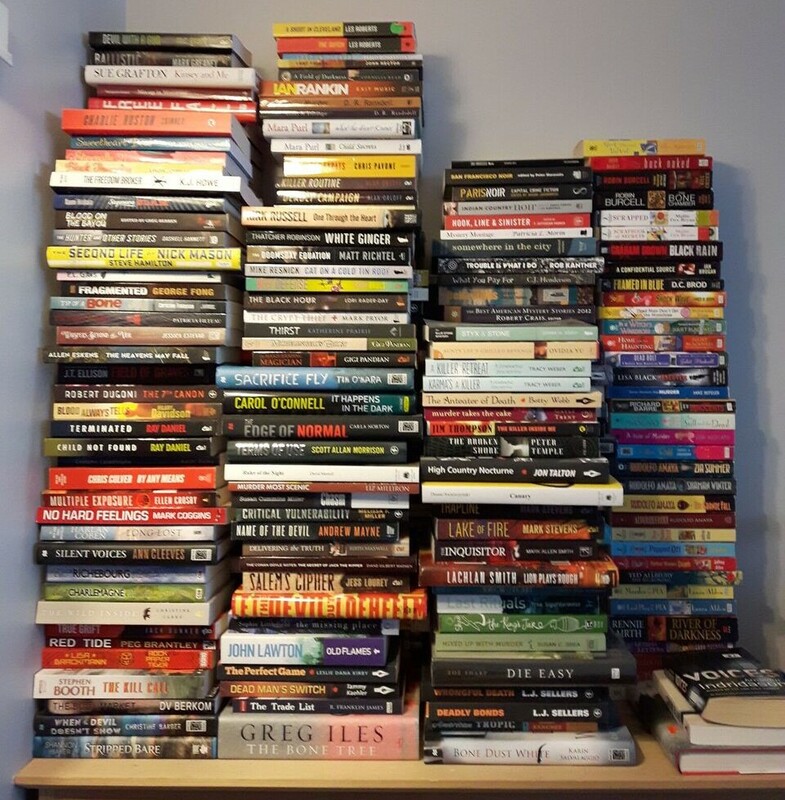 And there are also the 1000s of unread books on my Kindle. Oh well, I better get back to reading this weekend! That is amazing ! I mean truly… You all are incredible! Glad to see I'm not the only one. I have books in two different houses. What pictures! My TBR is all digital or still on the bookcase. 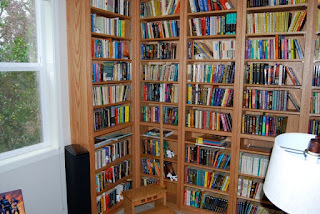 And not everything on the bookcases are TBR. 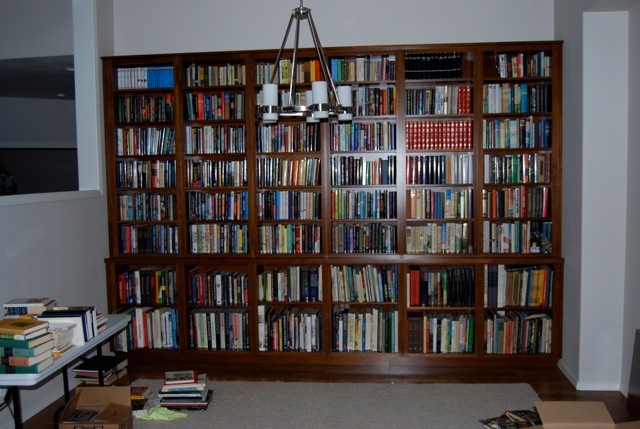 But if the Reds ever do a bookcase comparison, I'm there. And what a lovely surprise to learn I won a copy of Ingrid's DUPLICITY! Thank you! 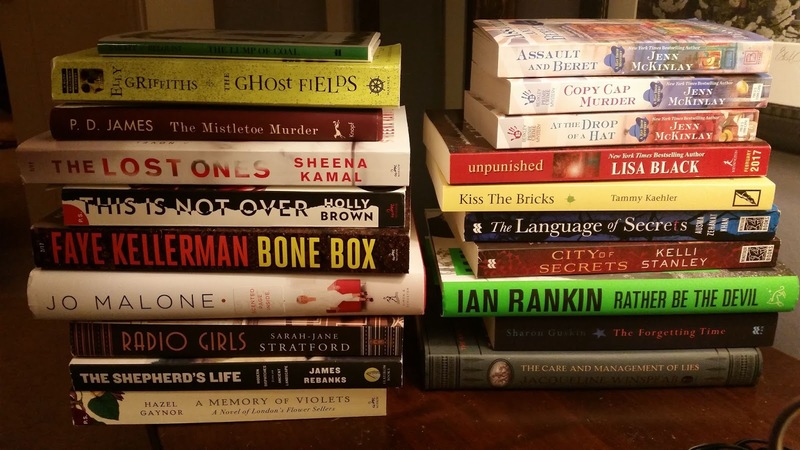 I feel so much better about my TBR pile seeing some of these. Mine looks most like Hank's - in quantity and location, her choices are a little more cerebral than mine. But I do have a fair number of writing craft books on mine, as well, like Margaret Title. We have a rule in the house - you must read for at least seven minutes a day (this is mostly a rule for the husband as he's bad about reading for pleasure; The Girl and I are more likely to need to be pulled away from a book) and it cannot be a "craft" book but must be fiction or a non-work/school-related non-fiction interest. There was a study done that showed reading for just seven minutes reduced stress by up t0 65% so that's why we chose seven minutes to be our minimum benchmark. Kathy Reel, I got The Soul Of An Octopus for Christmas 2015 and it's amazing! Also, pull out Salem's Cipher and read it right now, you won't be sorry. Love all these pics! I would like to note that these books are only my to-be-read-next books. 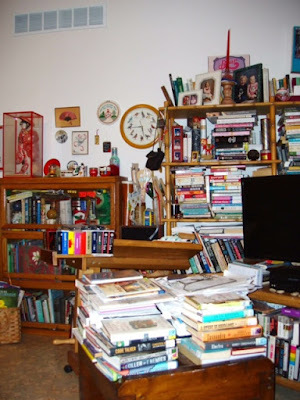 I have three sets of shelves, several small book carts or shelves, a very large glass bookcase, and baskets and two copper tubs. All full of read and unread books. Aimee, I have so meant to read Salem's Cipher before now. I will move it on up the stack. 3 Assemble two new bookcases! Kathy: I agree with Aimee. You will love Salem's Cipher. I almost sent pictures of mine but thought nobody would believe it! Instead, I see that I could walk into any of your homes and feel right at home! And Ingrid, last weekend I finished binge-reading all four of your books. I am now waiting impatiently for another. Patience "Anonymous!" Today we are marching, tomorrow we will post. Deb R., I'm writing as fast as I can! 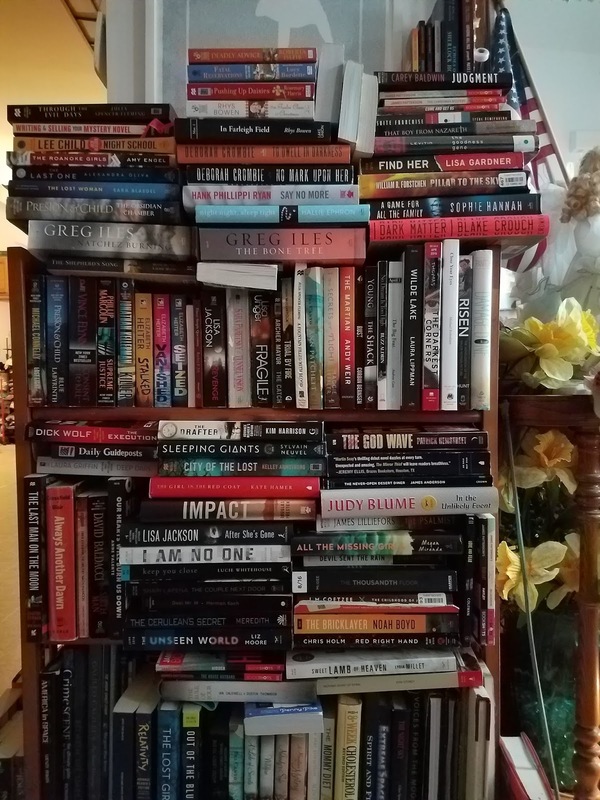 Those stacks are impressive, everyone! Like others, Mark, I'm worried about your safety under all those books. At least they aren't coffee table books, I suppose! Great photos! Nice surprise to see my photos :-) Already read some of the books in the TBR pile. Congratulations to the winner of Krista Davis' Mission Impawsible book. I'm reading the third of my three library books. Then on to my little pile of TBR next books. Then I'll check the tote bag upstairs. Of course by then more books will have drifted in from the library or purchased. And then there are books calling to me from the Nook. . . Glad to know I'm not the only addict around here. Good reading weather here; it's been raining and storming off and on for days. I love these stacks! 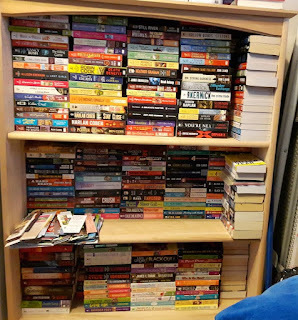 I shouldn't have been too embarrassed to post a picture of my triple stacked, overflowing shelves!! And that's not counting all the books on my Kindle--including Ingrid's! I'm going to be on the road for most of February and the Paperwhite is going with me. Oh I feel so much better just looking at your piles - you can come to my house!! I think I'd need to add quite a few more books before I were in any danger from that bunk falling in on me. However, the thought has crossed my mind more than once, I must admit. Oooh ... I was envious of Lucy's chance to read The Forgotten Garden for the first time, and now Kathy Reel has the first four books of Ann Cleeve's Shetland series to enjoy. Not to mention that Kathy has not one but two early Elly Griffiths books and two Peter May books, too. The last I read of his was Coffin Road. And Debs has the new Ian Rankin! 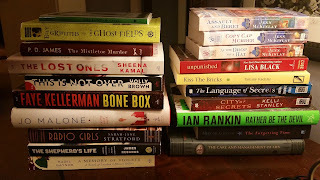 Such TBR stack envy I am having. 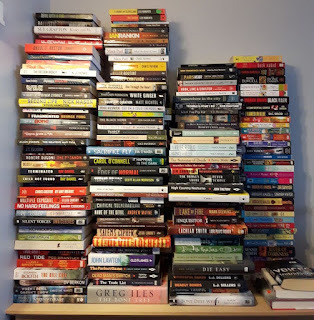 Next up on my current (rather depleted) stack are Barry Maitland's Ash Island, Different Class by Joanne Harris, and The Nowhere Man by Gregg Hurwitz. Hoping to get my hands on The Beautiful Dead by Belinda Bauer soon as well as A Hunt in Winter by Conor Brady, and Death Ship by Jim Kelly. These are great. I don't feel so overwhelmed about my own TBR piles. And the winner of Leslie Karst's book from yesterday's post is LIBBY DODD! Congratulations to the winner of Leslie Karst's new book.